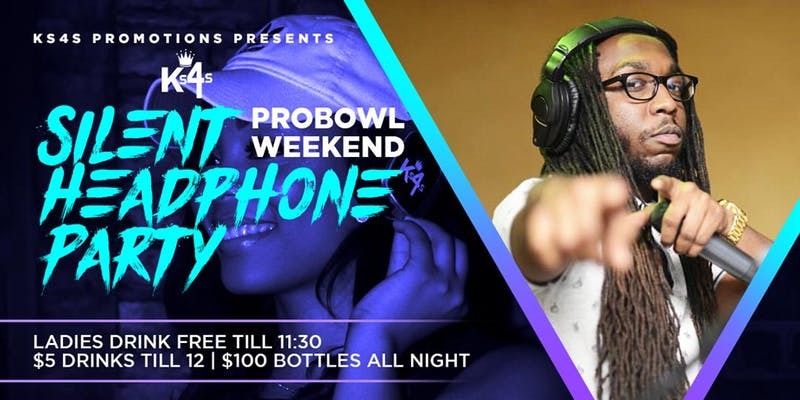 Silent Headphone Party “Pro Bowl Weekend” at Shakai Lounge featuring 3 DJs, drink specials, and hookahs, plus NFL special guest appearance. HOW IT WORKS: When you arrive you’ll receive a pair of Ks4s wireless headphones. You can adjust the volume and choose between up to three DJ’s with a flip of a switch. Each headset has a color (BLUE, RED, GREEN) LED that shows what channel you are listening to, so you can dance along with those listening to the same DJ. It’s super social; just lower the volume or take the headphones off to talk to that girl or guy. There’s no loud music that you have to talk over. Plus, there’s no ringing in your ears when you leave! Follow our page on Instagram @Ks4spromotions for more infomation and future events in a city near you! !